An adorable silver hair bat who spent time at Save Lucy. Hi everyone! I hope you all had a good week. My week started with my dog’s birthday. We’ve been celebrating and spoiling her all week. Yesterday, there was an earthquake in Alaska. I decided to research an Alaskan bat. I found an adorable bat called the Silver-haired bat. The Silver-haired bat lives in the temperate rain forests of Southeast Alaska. Actually, these bats live throughout the United States, including Save Lucy’s state of Virginia, and southern Canada. The Silver-haired bat has black fur all over its body except for their ears. 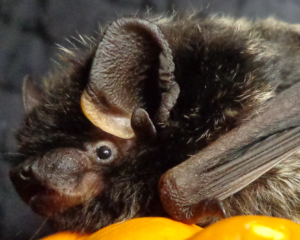 The black fur on their back has silver tips which makes the bat look like it has a back full of silver fur. These bats also have short round and hairless ears that lay close to their head. Like all bats in North America, these bats are insectivores. They love to munch on an assortment of meals such as flies, moths, mosquitoes, beetles, ants, and crickets. Silver-haired bats like to roost near water in areas near lakes, ponds, and streams. They roost here because they hunt close to the water where there is an abundance of tasty bugs for them to crunch on. They roost in tree foliage, under loose bark, and sometimes buildings. They like to hibernate under loose bark and in tree hollows. If you would like to learn more about the Silver-haired bat, you can read about them here and here. Previous StoryLips of bulldog, cheek of chipmunk, toe of ? ?